Warm up for winter with these exciting curries that will tickle your every sense. 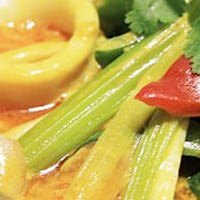 Think Green Curry with Fish, Massaman Curry with Beef, Yellow Curry with Vegetables and more. Let Chef Wanitha Tanasingam show you how to balance hot, sour, sweet, salty and bitter in this class of aromas and flavours that she learned from her father as he cooked for visiting Thai dignitaries. As always, classes are suitable for novices as well as experienced cooks. You help make a number of recipes hands-on, with some demonstration, and an interactive part to each class where knife skills are taught as well as kitchen basics. VictorsFood have partnered with Zwilling J.A. Henckels to use their knives for all of our corporate cooking events and cooking classes. As a VictorsFood cooking class customer you can purchase one of your own at an amazing discounted price. 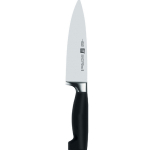 Choose from a 16cm Chef’s knife (Your price – $104, RRP $160) or a 20cm Chef’s Knife (Your price – $134, RRP $190) . Select your option from the dropdown below before registering. You will pick up your brand new knife on the day of your class. Read more about the Zwilling Knives. Victor has a way of making you feel like you've known him all your life and Galit was so knowledgeable and made you feel really relaxed and explained things so well it's made me want to book in for the next class! The memory of that wonderful food and Wanitha's sunny smile has brightened the last couple of rather grey rainy days. Absolutely fantastic experience (again). I will be back for more, for sure! Anyone can read a cookbook and take it from there. Victor's cooking classes are a great opportunity to learn from a superb chef who is able to teach in a relaxed environment - a real experience. I think they're great social events, and I've learned lots from every one I've done. It was excellent, and exceeded my expectations. I have already encouraged some friends to book a cooking class. The end result of the cooking class was amazing. It was a bonding experience to sit down with people I barely knew and enjoy a hearty and delicious meal together which we had all contributed to in one way or another. A VictorsFood cooking class was a great birthday gift for my husband. The class was very comprehensive and we enjoyed a lovely meal. So much fun; Great way to spend the day. I've never done a cooking class, as I'm a reasonable cook, but I found this class immensely enjoyable and would do another in a heartbeat. We found the cooking class thoroughly enjoyable and are looking forward to plying our new skills with friends!